"Refusing to ask for help when you really need it is refusing the chance for someone to be helpful...Let us help!" 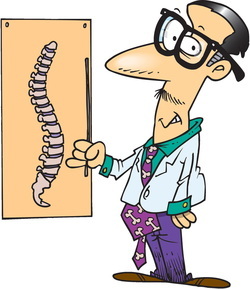 Before you do any of the "Helpful Hints" you should contact us or your local chiropractor for a proper examination and care to determine the extent of your injury. Protect, Rest, Ice, Compress & Elevate! 1 . I hurt my neck and/or back and I don't know what to use? (Also use on other injured areas o f the body). Use ice first, put ice on injured area for 15-20 minutes every 30-60 minutes for 2 full days or till you no longer feel any benefit from the ice. You should begin using moist heat for 10-15 minutes every 2-3 hours on the injured area once you no longer get any benefit from the ice treatment. After applying heat do some light stretching to the injured area for 2-5 minutes followed by ice treatment. Do this 3-5 times per day. 2. Should I just lay in bed or on the floor till it gets better? Its "OK" to lay in bed or on the floor, but not all day. You need to move the body at least 20-30 minutes a day even though you are hurting. You can get up and walk around the house for a few minutes and then go lay back down. This will prevent muscle weakness. While laying down its best to lay on your back with 1-2 pillows under your neck and 2-3 pillows under your knees with ice under the injured area. If you lay on your side be sure to put 1-2 pillows between your knees, make sure your knees are 1 on top of the other.